Welcome to the Living and Raw Foods Bookstore. We have formed a partnership with amazon.com, one of the largest bookstores online to save you up to 30% retail prices on some of the most popular living and raw food books. Most bookstores "downtown" rarely carry raw and living food books. When store clerks are asked about raw and living food books, they often do not know what you are talking about. We are providing this online bookstore to solve this problem, furthermore you will save up to 30% off list prices! In this revised and expanded edition of her highly praised book, 12 Steps to Raw Foods, award-winning author Victoria Boutenko outlines the many advantages of eating fresh rather than cooked foods. Providing the most current scientific research, she guides readers out of "cooked-food dependency" through the physical, psychological, and spiritual phases of the raw-foods lifestyle. Boutenko also covers practical aspects, offering helpful tips and coping strategies for forming and maintaining healthy new patterns. 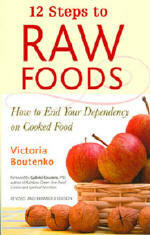 Boutenko's expert knowledge combined with her engaging style makes this book useful for seasoned raw-fooders as well as anyone interested in healthy living. SAVE over 30% off the retail price! Please choose the category you wish to browse, or enter your search query below. Search for ANY book just fill out the form below!